It’s Saturday and is FA cup day, however, it was full steam ahead in the Fuggles kitchen, Mrs Fuggles was making the Christmas puddings, not for the coming Yule time but the one after. She always makes them 15 months in advance, they taste better apparently, well that’s what Delia says anyway. The whole process started on Thursday, Fuggles had to fetch the alcohol that goes into the giant mixing bowl, this year we used Elgood’s Scotch Ale, coming in at a whopping 9%, we are using this instead of the barley wine. For the stout we are using Guinness Export with a strength of 7.5%. Now Mrs Fuggles only uses 125ml of each which means Fuggles has to swig down what’s leftover. Mrs Fuggles pours the bottle remnants into a pint glass and hands the brown foaming concoction over to a reticent Fuggles. My god, it was like drinking a pint of Covonia, it took a bit of getting down, but a man’s duty is a man’s duty. Early Friday morning there was a bit of turbulence in the air, the motion sensors were in over-drive and by mid-morning all hell let loose. It was like the siege of Moscow, the 1812 overture, such was the emotion it brought tears to Fuggles eyes, it’s fair to say the whole experience was a pain in the arse. Parker arrived at around 11:00, the PRATS have travelled to many delightful parts of the country, but for every Ying there is a Yang, today we go to Solihull. Is it solly or sowly? we much prefer Charley. Damn and blast our pre-match plans have been scuppered, we had planned to go the micro-pub the Pup & Duckling in Solihull but they don’t open until 5:00pm on a Saturday, 5:00pm on a Saturday, are you sure? 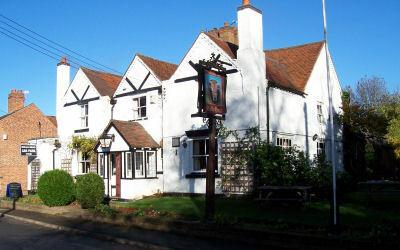 Instead we went to the Bulls Head Barston a nice village local which has been in the Good Beer Guide for 24 years and winner of the Solihull CAMRA Pub of the year 2016, the 7th time it’s won the accolade. $ hand-pumps in the bar, Adnams Bitter and Purity Mad Goose are the regulars, the guest ales were Hooky from Hook Norton and Bootleg Brewery’s Lawless. Fuggles went for the Lawless, a pale ale with a hint of citrus. Traditional session ale coming in at 3.8%, it didn’t have a lot to say for itself. A very slight aftertaste, refreshing but that’s about it. It was in decent condition, nice and clear with a good head. Pharp and Citra went for the Mad Goose, a delightful blonde ale coming in at 4.2%. a very slight haze was the only thing we could find wrong with it. A zesty ale, loads of Citrusy notes, right up Citra’s street. Parker went for a very large mug of coffee. Within a few minutes the Inbred Village Idiots Faction arrived, Vlad, Vladling and Broughton’s most inspirational half-wit and model railway enthusiast Tailby OO entered the bar. For the next thirty minutes we solved all the problems on the pitch, easy really. We had another pint each, this time we all had Mad Goose, Parker had another very large mug of coffee. It was time to move on, our target pub was the Vaults in Knowle, only a couple of miles away. After a few minutes of driving up and down Knowle High St we finally came upon our destination, but drat and double drat is was closed, no lights on, doors shut and a for sale sign adjacent to the building. Soddit, so we quickly scanned Whatpub on the Iphone and came across the Acres just a few miles away and near the ground. As we approached our new destination we received a text from the Weebles saying they were in the Vaults, treble drat and quadruple drat, it wasn’t shut. 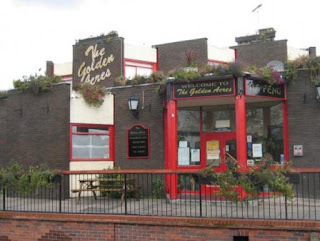 Several expletives later after driving through a 60’s housing estate, we came across a pub, where on earth were we? We gingerly walked into the bar, a large room which could easily double as a night club with the lights on. Tall flowers in thin vases on every table, a few chaps milling at the bar and there in the distance, leaning on the bar was a bloke in a Poppies shirt, it was Gretton Poppy. According to Whatpub they have 4 hand-pumps with a good selection of ales. A quick scan up and down the bar, then a second scan up and down the bar. Aaaaaarrrrrrggggghhhhhh, it suddenly dawned on the PRATS, only one hand-pump had a pump clip, 5-tuple drat and six-tuple drat. Bloody Doombar is the only ale available. The Poppies match against a team 2 leagues higher is not the greatest challenge to be undertaken today. We ordered the stuff, held our noses and sipped, It reminded Fuggles of the dentists, although there was nothing to spit into. At least the pub and the landlord were pleasant, a huge tray of hot spicy wings was placed on the bar for all to enjoy. We didn’t indulge, we just sipped quietly with accompanying grimaces. The stuff was duly consumed and we moved on to The Automated Technology Group Stadium. Not a bad ground I suppose, although probably needs a bit of work doing to it if the Moors intend to stay in the National Conference for long. There was the merest hint of kerosene in the air, Brum airport is just a few miles away, aeroplanes can be seen and heard jetting off to exotic idyll’s, such as Barbados, Antiqua, Isle of Man. Citra asked if there was rain in the air, Pharp pointed to the 747 passing nearby and suggested someone had flushed the toilet, Citra hoped the macerator was functioning correctly, splat! oh dear. The game, well the Poppies were clearly second best, not on effort but purely on class. The Moors had more time on the ball, rarely hurried and made very few errors. They will probably consider their day as a professional job well done. We didn’t let ourselves down, we had our moments and could have scored more than just a solitary goal. But that is the cup run over for another season. Hopefully next time we come here it will be as equals in a league game. Time for home, we decided not to go to the Pup and Duckling and chose instead to go to the Woodfarm Brewery tap, we arrived just before 5:45pm. Hang on, what’s afoot, no ales whatsoever from Woodfarm or Kendrick’s brewery. 7-tuple drat and 8-tuple drat, the brewers have moved out and gone to the Pig ‘n’ Muck a few miles away in Claybrooke Magna. Still there were 4 ales to choose from, 2 from Dowbridges, brewed just down the road in Catthorpe, one from Milesone brewery of Newark and another from ‘we forgot’ the name of the brewer but it was called Howler and Pharp went for this. A red ale coming in at 4.5%, it certainly looked rich and fruity, it was clear and a very tight head. Fuggles and Citra went for Milestone’s Pekko, a delightfully refreshing pale ale, just 3.9% easy drinking. Quite a good citrus aroma, slightly sweet with a bitter finish, very nice. Parker had another cup of coffee, he’ll be awake all night. Next up, Pharp and Citra stayed with what they had whilst Fuggles went for Dowbridge’s Ratae’d, 4.3% a golden-pale ale, quite tasty with a hoppy aroma. Served in good condition, very clear with a tight head. That was it for the night, we were home around 8:00pm.